One of the albums I've been anticipating greatly this year has finally arrived. With more excellent artwork from Alexander Brown and released on the great Dark Descent Records this had all the makings of something epic even prior to having heard it. Netherwards presents four behemoth songs equaling 40 minutes that perfectly straddle doom and death metal, more leaning towards doom the majority of the time. And man can they blend the two expertly. The writing here is excellent, placing slow gulfs of abyssal doom metal then at the perfect moments cranking up the intensity with bursts of slow, almost Portal or Witchrsit-esque chunky, filthy gallops and tremolo riffs. Reverb and other effects are used carefully to bring out the cavernous tone even more so. This is a mighty step up from The Drear. Putrid growls shudder forth from chasms unknown, only in one section do they switch to a cleaner moan in the middle of one track. The bass quakes under the rhythm with a snarl, as the spellbinding drumming swings easily and comfortably from slow, plodding smashes for doom and the faster torrent of clattering in the more death-like moments. Each track offers something different with simple elements but entirely saturated with suffocating atmosphere, sorrow and pain. "Saturnine" definitely shows off clearly how well these guys use both of the genres. It opens with a low hissing and cycling as rumbles slowly emerge growing in volume. Suddenly we're met with the first wicked riff, dirty and dark. This slams into a slow groove soon and just as you're nodding your head, a more hypnotizing chunky doom gallop appears with a well placed bend/pinched harmonic. A solo dives behind it for several measures, disappears, and we return to the death riffs after a nice string scrape. After a return to that wicked galloping grove there's a section with effects, and then the filthy death rears it's head, closing with an eerie clean section. "Estrangement" was the first track released and is far more like The Drear than the rest of the album, taking us back to a somewhat melodic, depressive traipse. Starting with clean ghostly notes, this is amped up quickly with a switch to high gain. The kickers start to pound as the riff turns very old school doomy (think Lycus or Pallbearer) and the growls surface. The pace is slowed and the riffs are sustained longer before repeating, then we're faced with a new slow tremolo riff and shrieks, which alters and picks up pace at points. Near the end a bleak solo is heard before the final riff starts: dark and gloomy and ever-entrancing. It's a melancholic track and the most straight-up doom song on the album. "Carne Liberatus" is the shortest track. Just over five minutes but no less devastating then the others and almost entirely death metal. We're treated with death tremolo riffs immediately, a very satisfying one at that, which switches to another high intensity section which they cycle through several times. Suddenly the bottom drops out and a chunky doom rhythm emerges with spectral moans occasionally swirling out behind the echoes; a solo with a warped bends whining midway through, and then a cold out. 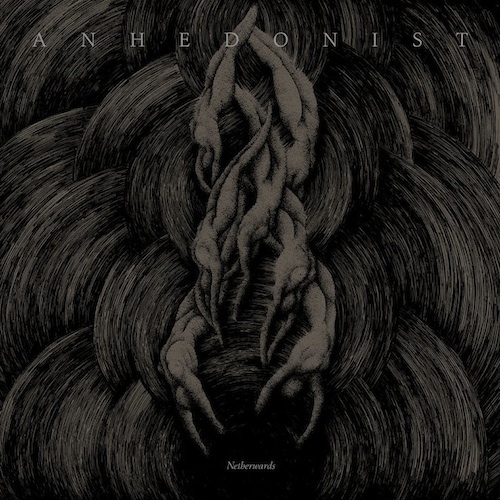 The final track, "Inherent Opprobrium", is the longest and again shows off Anhedonist's fantastic ability to bring the best of both genres out and craft something breathtaking. It's a clean and somber open with slow pounds from the drums — a second guitar explodes as the other continues the clean riff. The distortion is turned up on the first guitar as the gloomy riff is continued with a solo to heighten the atmosphere. As a new bleak section is continued there's a short pause for a bass line, and then both guitars crash back in with pained howls shaking throughout. After returning to earlier riffs a more death-like passage is heard with tasty coarse gallops. As the album closes previous riffs come back, haunting and desolate, before a ending with a sudden drop of all instruments except the kickers from the drums — then a swift return of the sharp lead guitar and tortured screams to seal the record with a final, slow, morose passage. I cannot recommend this enough. Definitely one of the best releases so far this year. Huge and heavy with the perfect balance of death metal and melodic doom. Never boring, always entrancing. Don't hesitate to pick this up if you haven't already preordered it. Go to Dark Descent right now and grab the cd. Really digging this so far!